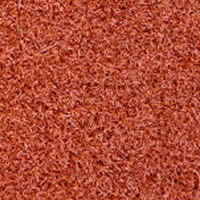 Practice Sports offers several varieties of pre-cut turf mats for baseball and softball practice. Our turf mats are made from a heavy-duty DuPont Nylon or econo Poly, including a 5 mm foam pad for shock absorption and a realistic feel. 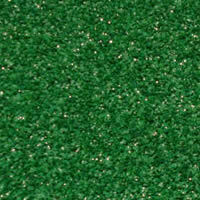 Our turf mats are approximately 3/4" thick including the foam pad, and stay in place very well under your feet. 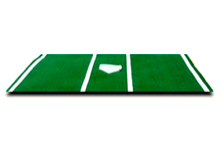 Excellent when used for a baseball mat or batting cage mat, our pre-cut 12' wide mats come with white in-laid lines representing the batter's box, with a home-plate either painted or in-laid. 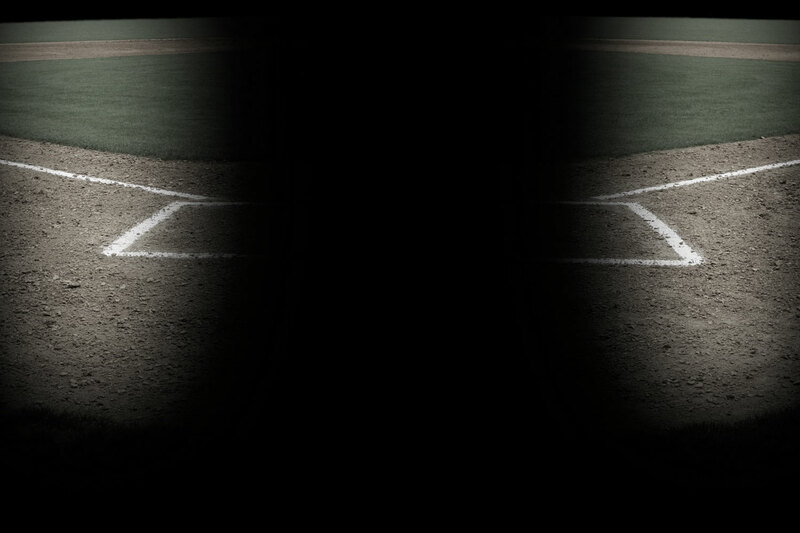 Our batter's box turf stance mats are essential to protect the area around home plate, and give players a solid and even surface with bright clean lines & plate for proper stance positioning. Tips: As long as you use a heavy-duty turf stance mat to protect the high-wear areas inside your batting cage, you can get away with using lower quality turf throughout the cage, as long as players will just be walking back and forth. 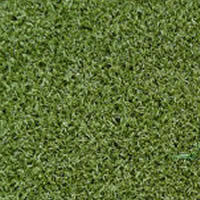 Poly turf mats are a great economical alternative for lighter-duty use, compared to the heavy-duty Nylon turf mats. Poly is a softer material with a lower abrasion resistance than Nylon, but are still solid and high quality mats. Made from straight blade Polypropylene material. Safe for rubber cleats or soft-shoes (not spikes). Skid-resistant bottom will not slide on almost any surface. Won't harm or mar gym floors. NEVER-FADE white batter's box lines are actual turf which is inlaid/tufted into the carpet during production. Home plate is painted on the mat, which can be easily touched up over the years. 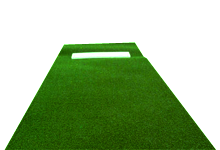 Approx total height with foam & face: 3/4"
Easily move this mat from diamond to diamond or field to field. Safe for cleats or spikes. NEVER-FADE batter's box white lines are real white turf inlaid/tufted during production. Home plate is either painted or inlaid into the mat (select option above). 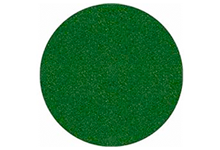 Our turf on-deck circles work great on baseball or softball fields. Available in either 4, 5, or 6 ft diameter, we can even customize a size to fit your field perfectly. Available standard in 2 shades of green, we can also build on deck circles in a wide variety of colors, and even in-lay your team name or logo. With a total height of pproximately 3/4" thick including the foam pad, these heavy-duty turf mats stay in place very well under your feet. Gluing to a concrete surface is optimal. Our softball mats allow you to train like a PRO softball pitcher, using a commercial grade turf softball mat with raised regulation rubber. Available with or without the "power-line", our softball mats will give your pitcher an excellent practice surface for simulating game conditions. Available in 10 feet or 11 feet long for taller players. The Power-Line gives helps players practice perfect stride and follow-through. Our softball powerline mats include a 4" white line in-laid into the turf.